Greece will need an extra 50bn euros ($55bn) over the next three years to stabilise its finances under the existing, disputed bailout plans, the International Monetary Fund (IMF) says. The IMF also cut its forecast for Greek economic growth from 2.5% to zero. And it repeated its earlier suggestion that Greece needed debt relief in the form of extended repayment periods and lower interest rates. The report comes ahead of Sunday’s referendum on existing bailout terms. The European Commission, the European Union’s executive arm – one of the “troika” of creditors along with the IMF and the European Central Bank – wants Athens to raise taxes and slash welfare spending to meet its debt obligations. 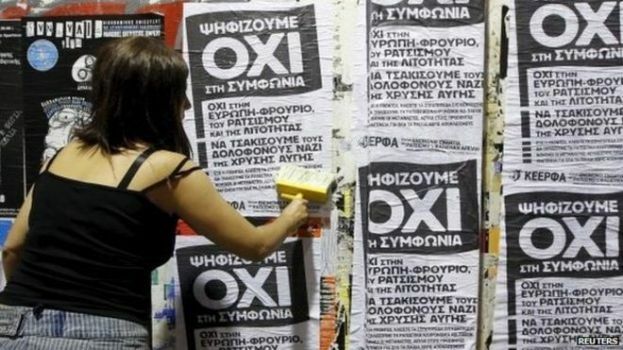 Greek Prime Minister Alexis Tsipras has urged Greeks to vote “No” to the creditors’ proposals, saying a rejection will lead to a “better agreement”. But the head of the grouping of eurozone finance ministers said a “No” vote would not provide Greece with an easy way out of its economic crisis, and the Greek PM’s suggestion was “simply wrong”. Meanwhile, long queues of pensioners have formed outside Greek banks for a second day.